"If all goes according to plan..."
Halo: The Master Chief Collection doesn't have a PC release date yet, but you might be able to get your hands on it this month. And that includes Halo Reach. Brian Jarrard, the Halo community director, announced the possibility of early access tests available to Halo Insiders. The tweet was posted on April 1, but it isn't a joke, despite the date. Jarrard also made a forum post stating that the Halo Reach test would come to Xbox One first, then PC, though he clarified that this could change and the order has not been decided. Both platforms will definitely get tests, however. To sign up for the Halo Insider programme, head over here. 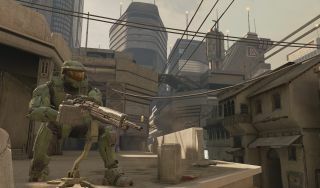 You'll get opportunities to play in public "flights" for other Halo games, too, so it should come in handy if you've got your eye on Halo Infinite. "Ultimately we want to get these games into player's hands as soon as possible," Jarrard said in regards to the MCC PC release date last month. "We're hesitant to commit to a firm time frame because the truth is they're ready when they're ready. Flighting will be critical to help us get these titles to a great place and depending on how that goes, it could lengthen or extend the release cadence." Expect more details on flights later this month.